We always seem to have leftover rice, it's easy to make in large quantities and often overestimate how much you need for one dish. So, rather than letting leftover rice go to waste, learn ways you can make delicious and inventive dishes from it. 2. Cut 1/2 inch off tops of tomatoes. Use a small knife to gently scoop out the insides of the tomatoes, being careful not to cut through the bottoms. 3. Sauté the onions for a few minutes in olive oil, until soft. 4. In a large bowl, combine the rice with the remaining ingredients, then combine the sautéed onions as well. 5. Using a small spoon, scoop the rice mixture and stuff each tomato. 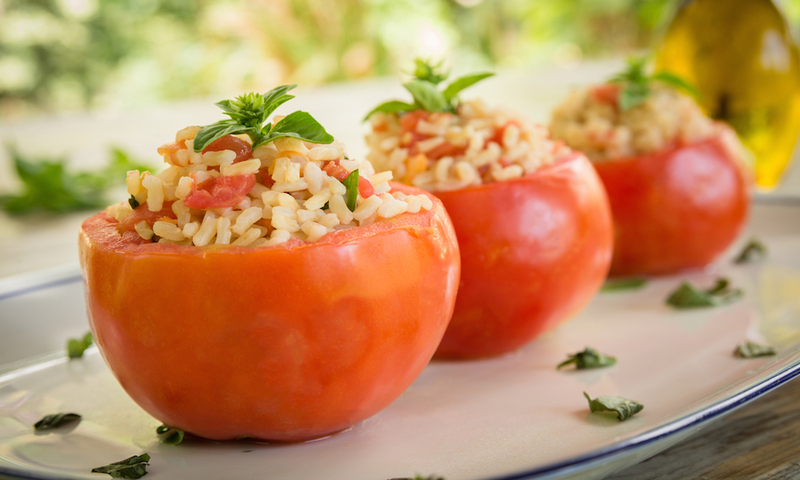 Gently pack the rice, so the whole tomato is full. 6. Lightly brush the tomatoes with a bit of olive oil and place in a baking dish. 1. Sauté onion in oil until soft. Add mushrooms, courgette and carrot and cook until soft. 2. The original recipe had cottage cheese in it, but if you're not into this like us, then add a handful of chopped, fresh herbs or any spices you have, from cumin to chilli powder or finely chopped peppers. 4. 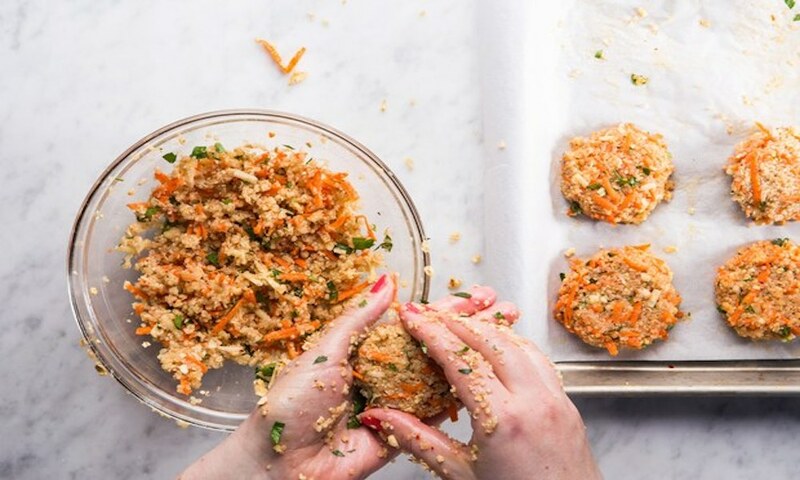 Press 1 tablespoon of mix into patties and roll in breadcrumbs. 5. Heat a little oil in a pan and cook patties on each side until golden brown. 1. Heat 1 ½ tablespoons of vegetable oil in a large nonstick skiller over high heat. 2. Add 1 beaten egg and swirl in the pan to make a thin omelet; once the edges firm up, use a spatula to to flip it over. Cook for another 15 seconds then slide it onto your cutting board. 3. Reheat the skillet (or wok) over medium-high heat. Add a tablespoon of oil and garlic. 4. Add vegetables, greens and pepper to the pan and stir fry to heat through. 5. Add 1-2 teaspoons of red curry paste. Taste to see if the flavor is sufficient, if not, then add more curry paste as needed. 6. Add the rice, keep stir-frying for 1-2 minutes. 7. Turn off heat, stir in the ginger and season with salt. 1. Combine the peanut oil, salt, black pepper, sugar and sesame oil in a small mixing bowl. Stir and whisk together until the sugar dissolves, then pour the mixture over the cooked and cooled rice in a large mixing bowl. Toss gently to coat the rice and combine well, then set aside. 2. Steam the carrots, snow peas and corn for a minute or two. Then stir the vegetable into the rice. 3. Add the remaining ingredients, including the rice vinegar, diced celery, bell pepper and green onions and stir to combine. Serve chilled garnished with the optional chopped fresh parsley.